This was my hardest half marathon out of all the half marathons I've ever run with a personal worst for time. Very hilly, a stream crossing, long lengths of mud. It was, however, an incredible trail run in an incredible area. My only regret is that I didn't stay longer to run more trails. Everyone should come and visit this area at least once. You will be happy you did. Well, happy at least after you climb the ski mountain. 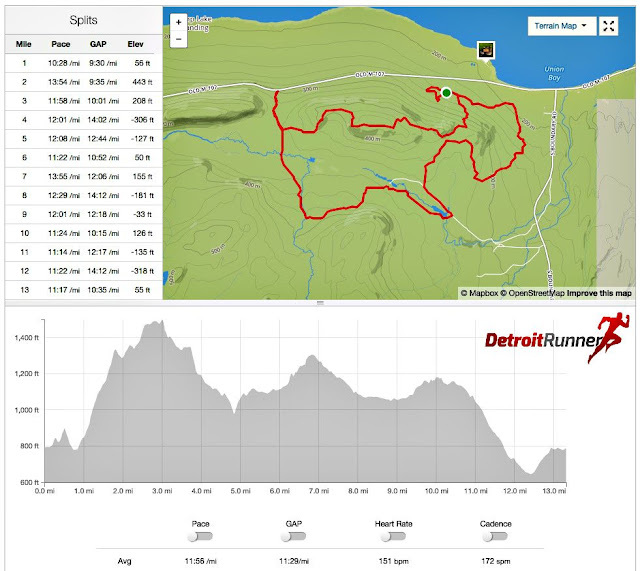 Great Lakes Endurance has once again proven they know how to pick trail courses to run. 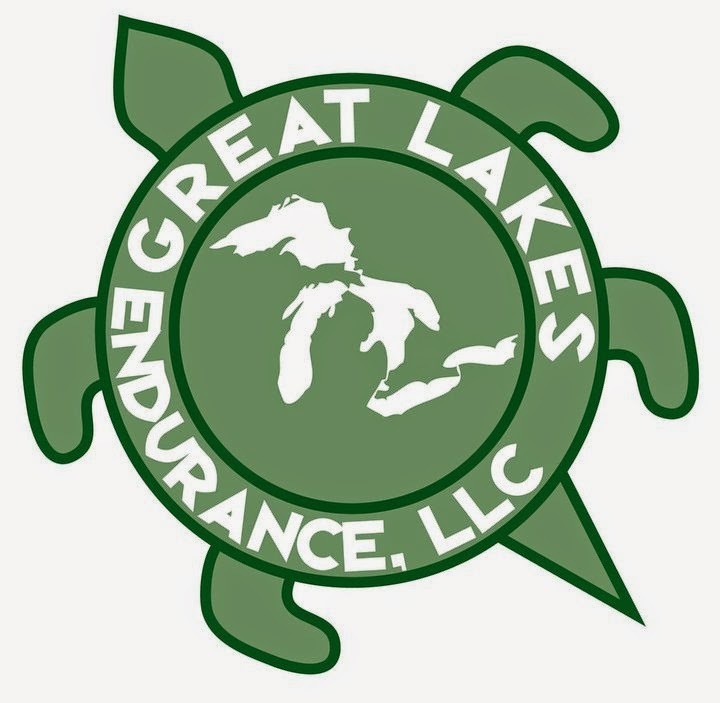 Registration is very easy and you can sign up online through the Great Lakes Endurance website via Active. The race does not typically sell out so you are able to register almost up to race time. Keep in mind they limit the number of runners so it's always best to sign up early. The race had two options for packet pickup. You could pick up your packet on Friday evening before the race (which is what I did) or you could pick it up race morning. I like having two options and usually Great Lakes Endurance does not do that. I will say that the race director will work out any extenuating circumstances for you though if needed which is awesome! 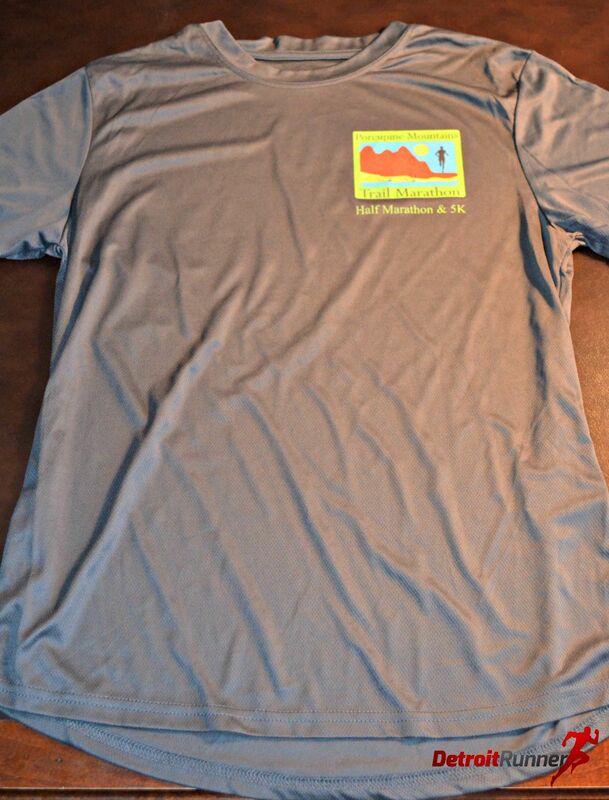 In my terrible blogger fashion, I got to the packet pickup which was at the local Americinn Hotel in Silver City and started talking to the race director and completely forgot to take a picture of the packet pickup. Oops! Well, they had everything set up and ready for the runners from 4-9pm at the hotel. I was in and out in a matter of minutes. Race morning also was easy for packet pickup since they were able to use the ski lodge. If you like to run (or hike) and you like to run trails, this is one of THE best places in Michigan to run. The trails were incredible and my only regret was not staying longer to run more of them. I really should have planned to stay an extra two days instead of leaving right after the race. It's about a 9.5 hour drive from the Detroit area so this is certainly not a close race but it was completely worth the drive. 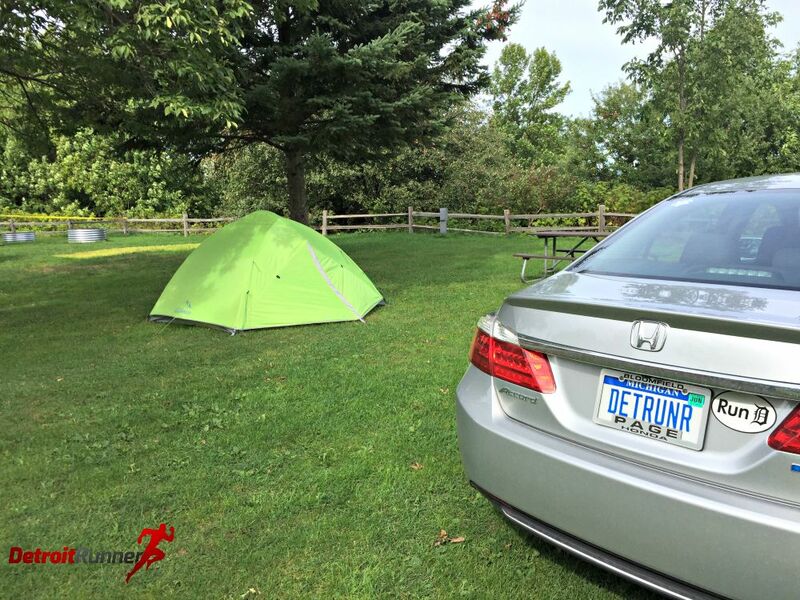 I decided to tent camp at the State Park which was perfect for this race. The campground was really nice (even though no shower since they were rebuilding them). It was right on lake Superior and while you can't see the lake well from my site, you can hear it all night long which is really cool! Also, the campground is literally a one minute drive to the start line so there was no need to get up at 4am to run the race especially since my race didn't start until 8:30am. When I got there on Friday, before making my way to packet pickup, I wanted to see Lake in the Clouds at the State Park. Wow! It's incredible and the trails there also looked equally nice. 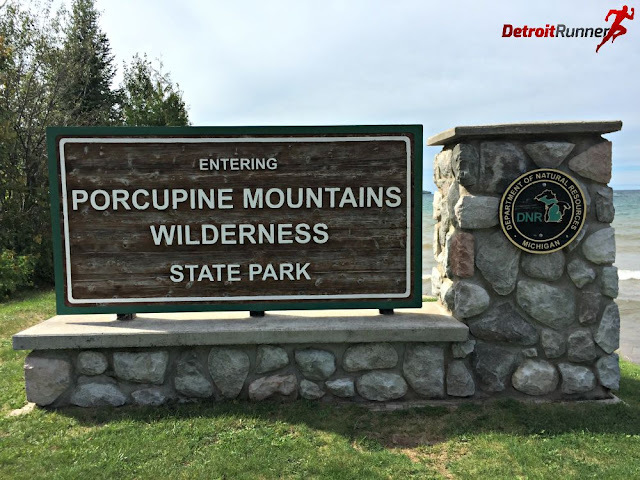 We certainly don't think about having mountains in Michigan and while they are not like other States, they were very impressive. I was hoping for a little more Fall color but unfortunately did not get it this time up here. I also went to a see some of the Superior trail as well where you can see more of Lake Superior from a tower, as you can see below. I'm glad I took the time to go see these sites. The park is huge and you could easily spend a week there running trails and still not see much of it. The next morning I made my way over to the race start area. The marathoners were starting at 8am and I got there just before they started running. There is plenty of parking for the race so no worries on where to park since we are in the ski lodge area. It was a beautiful day and the weather up here can be very unpredictable. We really lucked out this year. The race director, Jeff, told me that it rained 3 inches on Thursday evening before the race. You'll see some of that rain still on the course later in the form of mud. As is typical for Great Lakes Endurance, Jeff, the race director explains about the course and what flags to follow so you don't get lost. I found the course to be well marked overall although there was one area I was a little unsure on but found the flags. As you can see below, the marathoners are ready to run and it's not a huge crowd. The race also had water and HEED set up and ready for the runners as well as getting the food ready for after the race. Due to the strong rains, the marathoners had to run a double loop for safety reasons. The lodge is very nice and I imagine would be really fun in the wintertime since they get a ton of snow! Next the half marathons were ready to run. The race director asked people who had run their races before and if this was their first trail race. Numerous hands went up for their first trail race. I can't imagine this being my first since it was so difficult! We basically did a loop with a short out and back section to an aid station. I didn't really have a goal for this other than to just enjoy the area. You can see from the map that I took a picture at the campsite which shows you how close I was to the start area. Also, check out that elevation chart. Nothing like running up a ski mountain to start off your half marathon race huh? In my usual fashion, I started out way too fast! It didn't take long before we were climbing hills. We would climb and climb and climb. I actually had to walk some in the second mile! Can't say I've ever done that for a half marathon before. The picture below wasn't even a quarter mile into the race and already it was really hilly. Soon it somewhat flattened out (not really) or at least didn't go really high up elevation. Haha! We made one more turn and you can see what you had ahead of you. We were going to be climbing for a bit. The elevation was crazy that first few miles that I stopped and turned around to take a picture of what we had just run up. Believe it or not, that is only part of it too! We were also running through grass too where normally people would be skiing so it made it even more difficult to run up. Nothing like looking at what you just ran! Then it was time to start coming back down. One of the best views we got on the course was coming down the mountain. The sun was coming up and you got an awesome view of lake Superior too. As we came down, people were cheering us on which gave you a boost of energy. Good thing too because we were going to need it for what was to come soon. We make our way around the parking area (and gives you an idea of the space there to park) and headed over to start climbing again. The picture below shows what we had to start running through. It was fairly thick grass and tall but eventually turned into a trail as we got further along up. We had to talk some of this (well I did at least) but many other runners were also walking this part too. Again I turned around to give you an idea of what we had just climbed. It was pretty steep! Yikes - don't look down! The view near the top was awesome though and worth all the hard work. Then it was back to climbing again! Ha! The views did not disappoint in this section with the lake right by us. It seemed as we got to a part where there was a view, there was more climbing. As the race director said, "it's an all uphill course" Ha. It sure seemed like it. Did I mention there's hills? Can you believe we are only at mile two at this point. I sure couldn't! Yeah, we had made it to the top of the ski mountain once again. As we made our way through the grassy area, we were ready to hit the woods and the trails which were just around the corner. Ah, I was in my glory. The trails I had been seeking since I got up to the area. Mile 3 proved to be pretty difficult as well. The race also offered a 5k run and I imagine that was every bit of a challenge as well. We got some spectacular views as we navigated the trails. Yes we have some mountains in Michigan. Then the single track portions started. I love running single track and this course was loaded with rocks and roots. It was quite technical for a good stretch and you really needed to watch your footing the entire time you were running. It was not crazy roots like the Tahqua race but you got a feel for what Tahqua was like here. I was pretty lucky and didn't fall once but I did have one close call. There were parts where the views were amazing that you wanted to take your eyes off the trail but you knew that could not happen. You needed focus on this part. I did stop to take the pictures though. I've always felt it was worth the extra 10 minutes on my time to get some incredible pictures. The woods here are incredible and feel like they are untouched. It really is a very remote place to run and I sure would not want to be back here without flags telling me where to go or at least a map. There were numerous areas with boards to run over. I love running on these parts. Usually it's fairly wet in these area and the reason for the boards. This was the case today too. Then we go to some rocky parts. This are was really challenging to run. The rocks were big and small and they were loose too. You didn't want to fall in this part. It would not have been pretty. This was actually the start of the Government Peak Trail where an aid station was located for the runners. The sun would peak through in areas of the trail but you didn't really need sunglasses as you ran in these areas since most were well shaded. As we continued, we began to see that the trail was getting muddier and wetter than other parts. Also, there were more boards to run through. Then some of the boards started to not be there and we were getting closer to water. You could start to hear the stream as you continued running. I even got a quick picture of some backcountry hikers that looked to be using hammocks to sleep. I would have loved to spend the night out in the back country like this. It looks so fun! Sure enough, we made it to a steam and this was a breathtaking area to run. There is nothing I love more than running on a trail near a stream. You just get this serene feeling being out there on the trails. The water was really rushing though today probably due to the rain. We also got a couple hours of rain the night before as well. Then we got to about the 6.5 mile mark. Yes, that's right, we had to cross the stream. OMG! I didn't even realize that there was a stream crossing until the day of the race! Wow, that was simply an awesome experience crossing over it. Yes, your feet got wet but it was so fun! Yes, we had to cross the stream! It really didn't matter if your feet were wet because then after this stream the mud really started to come in parts. You just could not jump over much of it so muddy - wet shoes it was for the next several miles. As you can see, the mud was long and wide! There was no getting around it. It sure made for some interesting footing. Some of this mud was the shoe sucking kind so you needed to make sure your shoes were on well, otherwise, you could have easily lost one. The mud subsided for a little bit but I figured it would be back soon enough. I actually took a turn to get the picture below as it was not right on the course. It was only a few steps off and thought it would be fun to see it. Sure enough, we were back to the mud! This was the muddiest course I've ever run. I can't imagine hiking this because the mud was everywhere and it was deep in parts too! The mud was unpassable - crazy! Then there was this pretty open area. The diversity of the area was incredible. 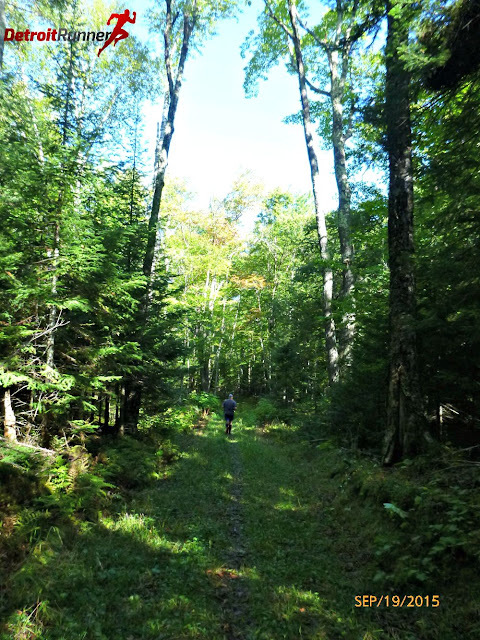 It felt like you were on numerous different kinds of trails along the way. Actually, we were on numerous trails. I could have stood there for a half hour just looking at that view......but I had to keep running! We then went onto a little two track. The mud came back again and this was the deepest, muddiest section of the entire course. It must have been for about a mile and I've not seen anything like it. I've been in muddy races before and nothing I've done has compared to this. I really enjoyed it! The mud went on for almost a mile! Essentially it was between 9 and 10 miles that the mud continued and it was relentless. The trail here widened and had there not been flags, I'm not sure I would have known this was a trails. Haha! By mile 11, it looked more like a trail and was easily marked to help us find our way. It felt so remote even though we were not too far from the finish line. I talked to a reader, Rob, pictured below who also was from Downstate. It was nice to talk to him for awhile to help pass the time but I could not keep up and he finished ahead of me. I was toast by this point and walked a little here and there. As we came through here, there was a girl cheering on the runners which was nice to see. We made our way back to the parking lot to come around where the finish was. As we came around, there were some spectators cheering for you. Given the size of the race, I was the only one coming into the finish at the time so it was nice they were cheering specifically for me. It makes you feel good when people do that. The finish was in view and I was ready for a break! 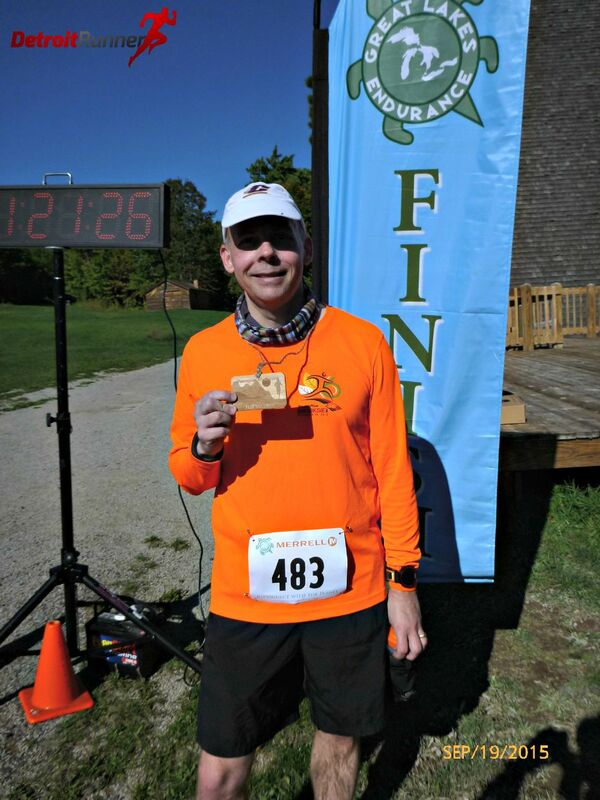 It was sweet success of yet another enjoyable race put on by Great Lakes Endurance. This was absolutely without a doubt the hardest of the five races I did with Great Lakes Endurance this year. Of course, the Grand Island Marathon was hard because of distance but otherwise, this was the hardest course of the shorter distances. They saved the best for last. The volunteers did an amazing job and were ready with water and Heed or gel when needed. One was at the Government peak trail start and the other was at a cabin in the middle of the woods. The finish area well well planned out and there was plenty of space for people to hang out and talk after the race. I asked a volunteer to take my picture at the finish. I was really looking forward to a tall glass of cherry juice that they always have after their races. It has really helped me keep any swelling down of my legs. For your entry, you received a marked and measured course. This was was probably especially tough to measure given the wilderness up here. You also received a tech shirt that I love. I choose the grey color but they also had green. I love their shirts as they fit great and there are no sponsors on the shirts at all. I also like they use a small logo on the chest. There's no need to have a huge one on the entire shirt. This will get used in training all the time. The race also offered finishers medal and keeping with their other races, this was a wooden medal with a great design. The organization was, once again, very good. 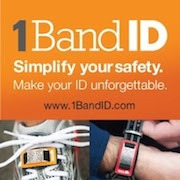 The website has all the information you need. They put posts on Facebook when needed. The finish and start area are well planned. The packet pickup was well organized. The course was well planned and the distance was at least 13.1. Overall, this is another race you are not going to want to miss. I realize for some of my readers that this is a long distance to travel for a half marathon but, heck, people travel the country to run in every State so I don't see the difference. It's in one of the most beautiful places in Michigan and the best plan is to stay for several days. Had my buddies came, it's likely I would have run another 20 miles during the weekend on other trails there. It's a great time of year to run this too and the weather was perfect for running. It was great sleeping weather in the tent too. 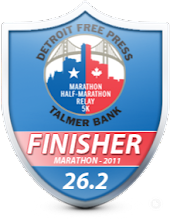 I cannot recommend this race enough and you should take your family up for a vacation and see the beautiful U.P. Since I ran all five of their Summer races including, Two Hearted Half, Waugoshance Half, Grand Island Full, Tahqua 25k and Porcupine Mountains half, as a token of their appreciation for doing the race reviews, the race gave me one of their custom pottery bowls they give out as age group awards. These are some really quality pieces and I was so excited to get one to keep as a memory of the great times I had this summer running with Great Lakes Endurance. 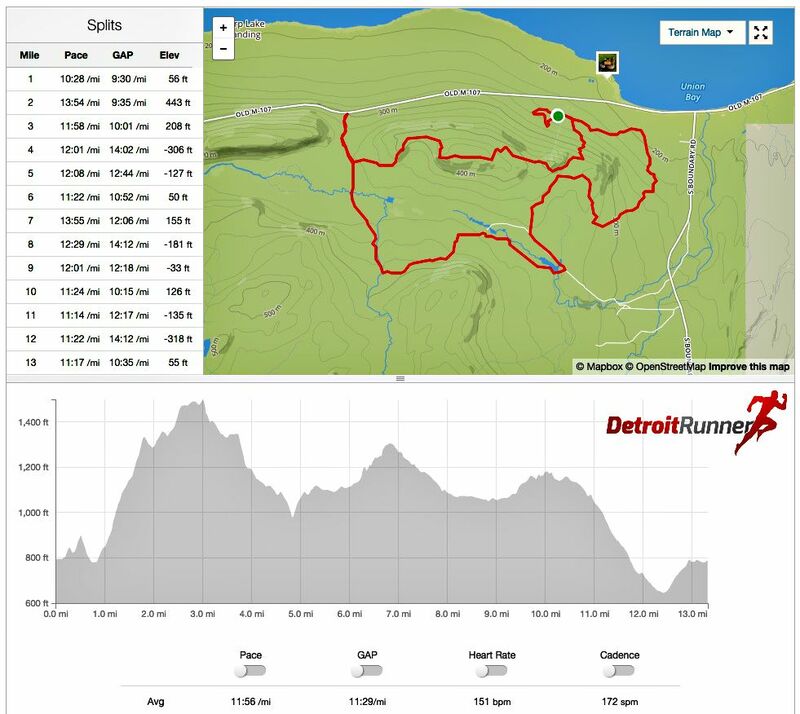 I highly recommend every race that I did as the courses are some of the best trails you will see in Michigan. Disclosure: I received a discounted race entry in exchange for this review. I was not required to give a particular opinion other than an honest one.